We had our breakfast and got ready to leave Kanha. The destination for the night was Aranyak Resort near Bandhavgarh National Park. 10:15 AM We left the resort. We wanted to also visit Ghughwa National Park where plan fossils were discovered. Unfortunately, nobody knew about it. Finally, some searching through Google and road signage told us that the Ghughwa National Park was midway between Kanha and Bandhavgarh on the same road. 12:34 PM We stopped at MPTDC Mandla Tourist Motel for a quick Lunch and continued on our journey. The roads are little bad in these parts but nothing that is not drivable. 2:50 PM We reached Ghughwa Fossil National Park. As expected the park was completely empty with no soul in sight. Ghughwa Fossils Park is the first park in the country where plan fossils as old as 65 million years old have been preserved. 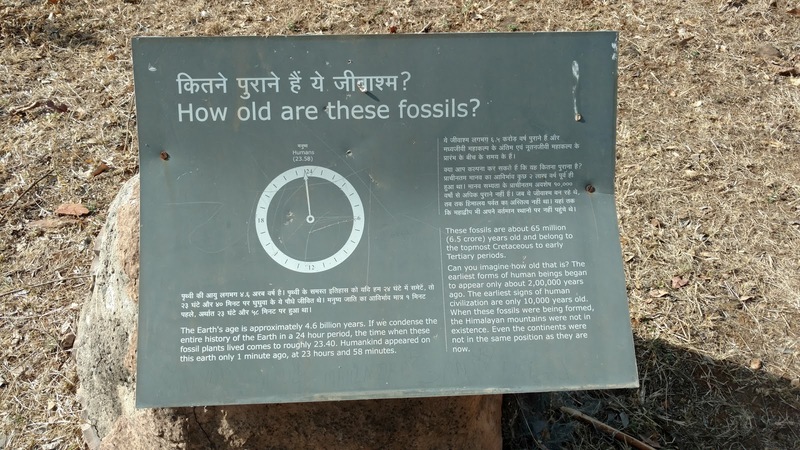 It was discovered in Dindori district in year 1970 by Dr. M. R. Ingle (Jabalpur Science College) and Dr. M. B. Bandhe (Birbal Sahni Institute of Paleobotanic). Plant fossils are wood like pieces which feel heavier, almost like stones. Fossils are priceless beacuse they are extremely rare and give us invaluable information about earth's past and the life that existed millions of years ago. The park has these fossils and there are trails around these. The fossils found in the park are plans of very ancient times. Palm fossils are numerous. Other fossilized plans include ancient forms of Banana, Rudraksh, Eucalyptus, Jackfruit, Jamun and Aonla. Their woody parts, leaves, flowers, fruits and seeds are represented in these fossils. Places where fossils have been found are, Mohgaon Kalan, Samnapur, Mohgaon, Parapani, Ghughuwa, Deori Khurd, Mehadwani, Devargarh. About 65 million years, the area of Ghughuwa was covered by forests similar to evergreen and semi-evergreen forests of today's western ghats and northeast India. These forests were made up of moisture loving plants. There was a three-tier forest structure consisting of small trees or shrubs growing below moderate to large-sized trees. The middle level had mostly trees of the palm group. Ghughuwa enjoyed a humid equatorial climate in ancient times with uniform temperatures throughout the year and an annual rainfall above 2000 mm as compared to 1400mm now. In those times, it also had a very long rainy season. Why did these plants die? The single landmass called Gondwana, comprising peninsular India, Australia, Madagascar, Antarctica and Africa, split up into these constituents which then slowly moved apart to take up their present positions. The Indian peninsula moved north. With this, the Indian peninsula no longer remained in the equatorial region. The seas receded from central India. These changes were initiated by frequent earthquakes, the flow of lava and upheavals which covered entire regions with salicaceous sediments. All this meant a drastic change in the climate and the moist evergreen forests died out to be replaced by the tropical dry deciduous forests of today which were more suited to the changed climatic conditions. Was Ghughuwa near the sea then? Mollusk fossils found here, as well as at Matka-Deorikhohani, Palasunder, Silthar-Chanti Hills, and Chargaon, indicate the presence of a large water body nearby. Some scientists have conjectured that an ancient branch of the sea called the Tethys Sea extended up to this area. Earliest forms of human beings began to appear only about 2,00,000 years ago. The earliest signs of human civilization are only 10,000 years old. These fossils were formed 65 million years ago, the Himalayan mountains were not even in existence then. Even the continents were not in the same position as they are now. 4:30 PM We left Ghughuwa and headed towards Bandhavgarh. 6:15 PM We arrived in Aranyak Resort near Bandhavgarh. Here is my review of the place.